GreenCleen provides cutting-edge sanitizing services for restrooms with cleaning levels that traditional methods are simply unable to match. 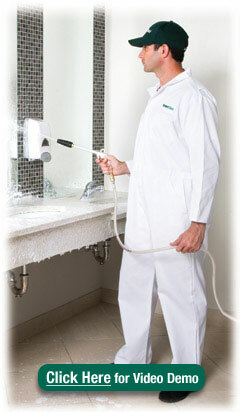 With GreenCleen, restrooms undergo a unique, five-step hygienic dirt and germ removal process that reaches deeply into even the tiniest cracks and crevices. With regular GreenCleen service, your company can enjoy a noticeably healthier work environment and promote a more inviting business image with customers and visitors alike. You simply cannot get a cleaner restroom…than a GreenCleen restroom. GreenCleen sanitizing agents are approved by the Design for the Environment (DfE), which is sponsored by the Environmental Protection Agency (EPA). Click the logo below for more information. Click on logo below to visit our parent company UniFirst Corporation.